A colourful mix of organic white, red and the more rare black quinoa which is very easy and quick to prepare. These versatile grains are conveniently packed in a microwaveable pouch for maximum freshness and flavour. Seasoned with extra virgin olive oil and unrefined Mediterranean sea salt, these delicious grains can be eaten hot or cold. Enjoy on their own, in stir-fries and salads or as a nutritious side dish. Water, white quinoa* (31%), red quinoa* (8.9%), black quinoa* (5%), extra virgin olive oli* (2%), sea salt (0.9%). 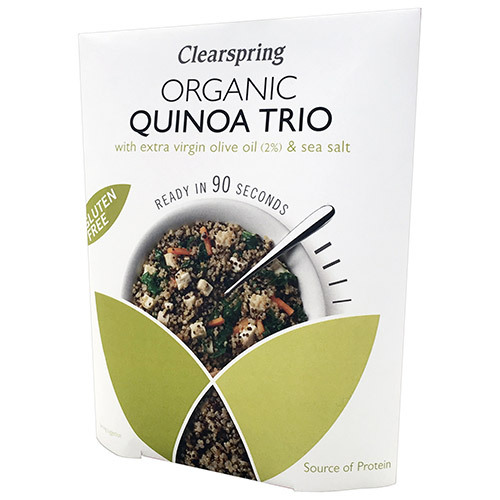 Below are reviews of Clearspring Organic Quinoa Trio with Extra Virgin Olive Oil & Sea Salt - 250g by bodykind customers. If you have tried this product we'd love to hear what you think so please leave a review.